Provide comfort for the family of Roland Gallaher with a meaningful gesture of sympathy. 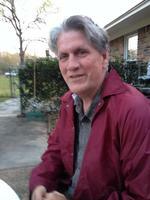 Roland Mead Gallaher, 61 of Pensacola, Florida passed away unexpectedly on April 2, 2019. He was preceded in death by his parents Bill & Iris Gallaher and an infant brother. He had a passion for grilling, cooking, fishing & golfing. He enjoyed watching football and was an avid FSU Seminole fan. He loved traveling mostly to areas with mountains. He will be greatly missed by his family & friends but will live on in our hearts forever. The family will have a celebration of life for Roland on Sunday, May 12th at 1:00 at Blue Angel Park located at 2100 Bronson Rd., Pensacola, FL Pavillion #3. To send flowers in memory of Roland Mead Gallaher, please visit our Heartfelt Sympathies Store. Provide comfort for the family of Roland Mead Gallaher by sending flowers. Paul and I are so sorry that Roland left this world so unexpectedly. We will always remember the good times we shared with him, and the rest of the family, and will keep his memory in our hearts.